Schwartz & Wade, 9780375862007, 144pp. 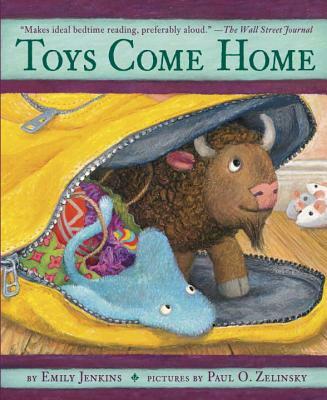 Here is the final book in the highly acclaimed Toys trilogy, which includes the companion books Toys Go Out and Toy Dance Party and chronicles the unforgettable adventures of three brave and loving toys. Fans of the series, as well as newcomers, will happily discover how Lumphy, StingRay, and Plastic came to live with the Girl. In six linked adventures, readers will also learn how the one-eared Sheep became one-eared, watch a cranky toy meet an unfortunate end, and best of all, learn why it’s okay for someone you truly love to puke on you. This is perhaps the most charming of three inimitably charming books destined to become classics.